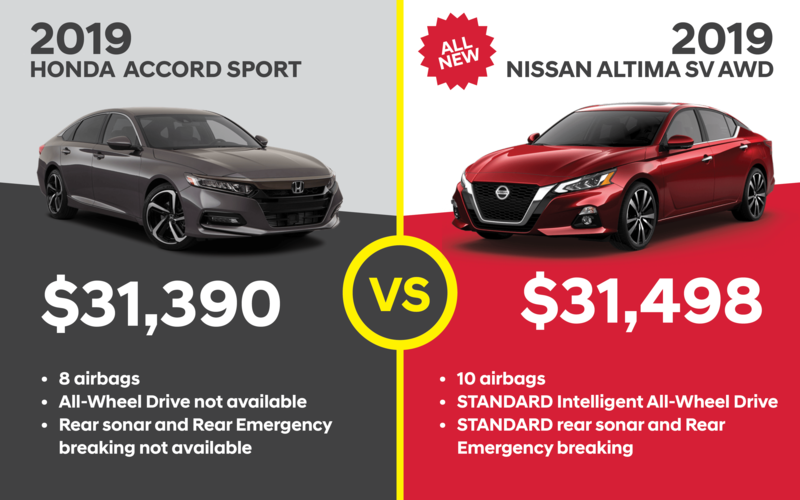 See how Nissan stacks up against the Competition! Made for Canadian weather, the Altima SV is Nissan’s first sedan with standard Intelligent All-Wheel Drive. Carry more with 437L of cargo volume and a bigger trunk opening. With standard LED headlights, taillights, fog lights and daytime running lights, driving at night has never been brighter. Detect objects behind you with standard Rear Sonar and Rear Emergency Braking. Stay on course and reduce driver fatigue on long drives. ProPilot Assist keeps you centered instead of bouncing you between the lane markings. With the click of a button, standard Remote Starter and Intelligent Climate Control keep you at comfortable temperatures year round.View our Inventory here.